Over thirty five years ago, Jubilee opened with some donated books, basic art materials and a set of homemade blocks. 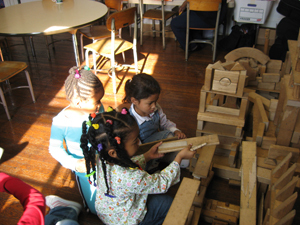 Throughout the years, building with blocks has been a vital part of early childhood education at Jubilee School. Block building contributes to developing a great variety of concepts in math and science. Its contribution to social studies is even more dramatic. Students observe neighborhoods, and then build their own versions of community. As they build together, they develop a sense of themselves as a community working towards a common goal. Using raw materials and their imaginations, they are able to create their own worlds. Integral to the work of block building are observation, problem solving, imagination and vision. Vision is required both for observing and for imagining. As a community, we’re working to build with clear vision. The foundation is laid in block building. As students outgrow blocks, they apply the skills they learned to academic areas. In looking at history, they work at facing the sometimes painful truths of the past in order to have the vision to imagine and build towards a better future for our community and the world.